By now you're all well and truly sick of hearing me and everyone else who was there bang on about the #voicesof2014 masterclass. But it wasn't all yummy food, copious cups of coffee and fabulous minds meeting to embrace each other in the offline world. There was actually some learning that went on as well. There were three panel sessions at the masterclass, and while I loved all of them and came away with a lot of food for thought, there was one panel that I was most interested in and got the most actionable information from. This panel was run by the lovely Maxabella (who I sadly didn't get the time to meet in person) and featured three speakers: Kat from The Organised Housewife, Jaclyn from Blog Society, and Yianni Konstantopoulos, the Director at Social@Ogilvy. Facebook pages have some pretty powerful analytics built in to them. It's a really good idea to use the Insights to see what posts work well, how people are interacting with your page, and most importantly, when your fans are online. By using these insights you can plan and post accordingly. Kat schedules all of her Facebook posts a week in advance, and they are always at the same time every day. She says her fans have come to expect this from her. While my audience (and yours) are probably very different to Kat's, there is something to be said for consistency. I'd already started investigating the page Insights before the masterclass but this last week I've been trialing scheduling some of my facebook posts. I've definitely seen an increase in the amount of people seeing the posts with links, and I'm pretty sure it's partly because I've scheduled them for times when a lot of my fans have been online. I am going to continue to experiment with this and see if the reach continues to be better. I'll let you know how I go. All panelists agreed that the images they post tend to get a wider reach when they upload multiple images at a time, say two or three. Another tip was to tag people in posts. For instance, you may have noticed that in one or two of my posts this week I tagged individual people, like my sisters. This works because when a person is tagged on facebook it shows up in the timeline ticker of their friends (depending on their privacy settings of course). When that happens their curious friends can click on the post to see what it is they've been tagged in and then you've reached more people. Not to mention the fact that you make sure your nearest and dearest are privy to your wit and wisdom! The important thing is to tag people appropriately and be sensitive to people who may not want to be tagged. I've only done this sparingly so far, and only with people I know wouldn't have a problem with it. 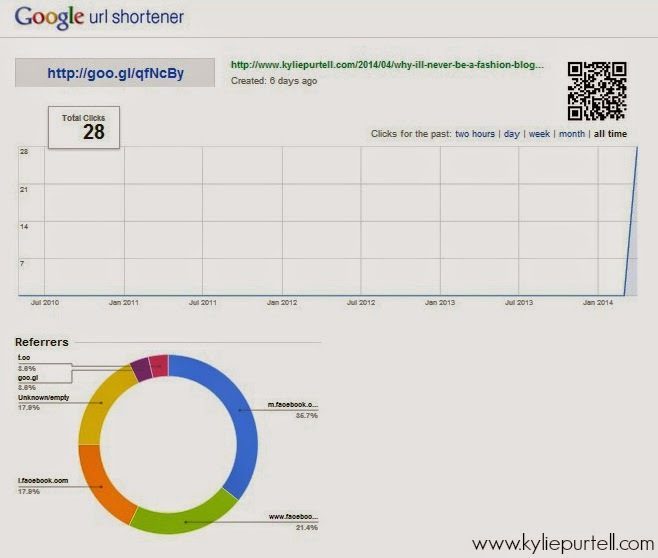 If your friends and family know that you blog they can be a really good tool for increasing reach as well. Ask people you know won't mind to engage with some of your page posts to help increase your visibility. We keep hearing people say that the best way to increase reach is to create and post content that people will engage in. But how do we get people to engage if they don't see content in the first place. And is it enough to just like a post? The short answer about likes is no. The best kind of engagement is shares and comments (I'll come back to shares later). Having people commenting on your posts is a great way to increase engagement and reach. Ask some of your friends and family to comment on some of your posts and even share one or two. Post things that people want to share. Ask questions of your fans, ones that can be answered easily and without much thought. I've started asking a question on my page at 1pm each day. Not only is it a great way to get people engaging with your page, but it's also really fun and interesting and allows you to interact with the people who matter most and who support you. More posts can actually decrease your reach. I was posting more often to my page in a bid to reach more people but it seems that this could actually work against us. Kat said that she posts 6 times a day with a combination of different stuff, links, images, etc. I've decided to limit my posts to between 4 and 6 a day and will continue to monitor if that makes anything difference. Now, getting back to the shares thing. It was stressed that having people share your posts is the best way to increase reach. But it's not that easy to get shares. Sometimes you might post something that you think is awesome and it goes nowhere. Other times something you post on the spur of the moment will get a few shares and lots of comments. It can be hit and miss. I'm sure people who's job it is to try and create viral content know what will and won't work but I'm no expert that's for sure! Before the masterclass I had an inkling that people sharing a page's posts was important and I was actually trying to think of a way to to incorporate that and get bloggers helping bloggers. After the masterclass I knew that I wanted to make it my mission to try and comment and share other bloggers posts to my personal page as much as I could. I've gotten so much from the blogging community that I feel like this is a small and easy way I can give back. So you may have noticed I've been quite prolific with the commenting on people's posts. Obviously one person isn't going to automatically increase a page's reach, but by gosh I'm gonna do what I can. Which is why I took a leap, had a go, and the other Sunday I did the first Share the love Sunday on my facebook page. The idea behind it is simple. You tag your facebook page and I visit it and comment on as many posts as I can, and share one. I do it all from my own personal facebook profile and not the page. The response was overwhelming and it was really great to see everyone getting on board. I found quite a few new pages to follow, and had a chance to visit pages that I already like, but who's posts I never see in my newsfeed. It was great! My friends might have got a little shirty with the amount of stuff I was suddenly sharing on my personal profile but I don't really care. It's one day, for a couple of hours and I actually had many friends comment on and view the things that I shared, so it was a win as far as I am concerned. I really loved catching up on peoples pages and I think, if the interest is there, I might do it again this Sunday. All I ask is people that play-along share the love and visit at least one other page and leave a few comments from their personal profile, maybe even share a post that particularly resonates with them. I promise you'll get a little warm, fuzzy feeling down low. 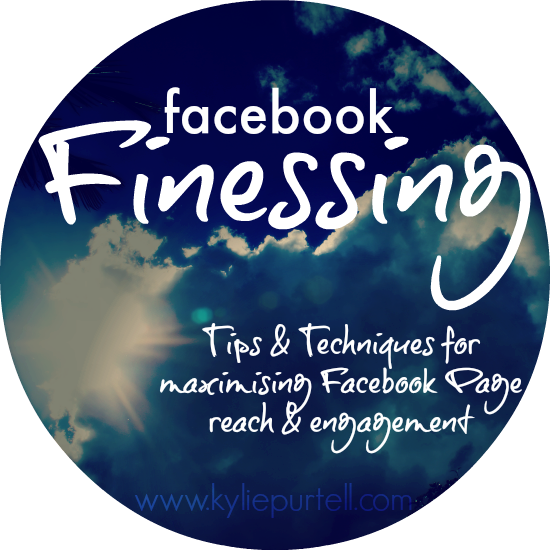 So there you have it, the facebook finessing tips and tricks I've learnt at the masterclass and things I've been doing to increase my page's reach and engagement. If you have any tips or tricks of your own please let me know in the comments. And feel free to post the link to your facebook page in the comments as well so I can stop by and share the love some more. Do you have a facebook page? Have you noticed the reach has been poor? What sorts of things to do you find people respond to best on your page? Facebook is an interesting (and unpredictable) thing isnt it. Love some of these ideas! This is a great idea! I'll be getting involved for sure next Sunday. Great informative post on FB.. thanks for sharing the tips. I'd like to play along for Share the Love! Weekends usually get kinda busy and I don't usually come online so if you do it on a weekday let me know! I'll try and lookout for it this weekend though. Aren't you a smarty pants!! Great post, at them moment I dont have a lot of time to devote to blogging and facebook but will refer back to this post when life is less crazy!! Loved your share the love sunday and fluked being on the computer when it was all going down!! I usually miss all these things!! Really good post Kylie - I appreciate the tips here. And I'll be happy to join in the sharing love when I can. Starting with sharing this really useful post I reckon! A brilliant post Kylie, have shared on twitter and will need to get involved in your Sunday Facebook sharing - sounds like a great idea! I think just when you work Facebook out they up and change the rules and in the scheme of things for the blog it really is only 5-10% of blog traffic and I invest far too much time on Facebook when I should and could be doing other things. I'm all for scheduled posts as long as you are checking in and replying and engaging with people. I recently signed on for a 12 week program but it was obvious all posts on fb were scheduled and no one was really looking after the fb page more than weekly which was off putting. Wow you post frequently! I have been posting every few days! I only post when I feel there's something to share that's worthwhile. I have lost a lot of interest in Facebook. I am playing a lot more on the other platforms and picking up followers there instead. Great post Kylie. 'Bloody Facebook' I swear I must mutter that at least 10 times a day! I can't believe I only discovered the analytics so recently (literally a week before the masterclass) they really do offer a huge amount of insight into the audience on your page. Who knew that most of my likers were online after 8pm? When I think about it, it makes perfect sense but there you go :) I always find that questions spark the most interest on my page. My lovely readers love sharing their experience and advice (or just their favourite takeaway) so I try and include them regularly. Some useful tips, thank you. I have used the analytics to work out when the best time to post is. What I noticed was, initially it increased my reach then it decreased dramatically a few weeks later. I think Facebook may have started penalising for posting at around the same time daily. I will be interested to hear how your 1pm things goes in the future. By the way are you doing the Facebook Sunday thing again? I would love to be involved. I have just had a go, facebook does this weird thing sometimes where it looks like you're only posting a direct link to the blog, but after you hit post, when someone clicks on the link it takes them to the actual post that you were sharing. Don't know if that helps, sorry. This is a great post! I've been using tags a lot this week and have been noticing a better reach with that. Especially if I use tags that are trending at the moment. I also make sure to take a page if I am linking up with their linky party. I've noticed a steady increase in the reach but damn it is so much work! Wow excellent Post Kylie thank you so much for putting this together. I really struggle with it all I am so not into the stats etc I hate having to play a game and try and second guess the FB nerds running the show. I like to just do my own little thing. On the other hand when you receive Facebook love it does give you a spring in your step. Why do they have to make it so damn complicated. Its the money of course it makes Facebook go round now. Very insightful and educational post. I was lapping up all this information. There is so much to take in. I agree that engagement is better... "likes" get sold so cheaply this days. It's too easy to "like" something that sometimes I wonder if it means anything anymore. I think only bloggers would bother to comment or share something. Most of my friends, even really good ones would hardly ever bother. They probably stalk me, but would avoid showing any evidence of it, LOL. This is such a wonderful story Kylie, you have explained thing so well. I have been blogging for nearly 5 years so I have an understanding of everything you mentioned but you have put it in concise, clear terms. Can I add something else. I have a list of foodie friends/ blogger friends on the right hand side of my website. This list represents blogs that I really enjoy reading but that can also be counted on to comment and share posts. As long as I share the love they share the love in return. I update this list to add new bloggers that I find who are equally active in social media promotion and drop off bloggers who aren't interested in reading what other bloggers have posted. I will pop over to Facebook and say hi, love what you are doing. I am in Bali at the moment so I may miss this Sunday but I hope to catch up the following. This is such a fantastic wrap up of the panel, Kylie. 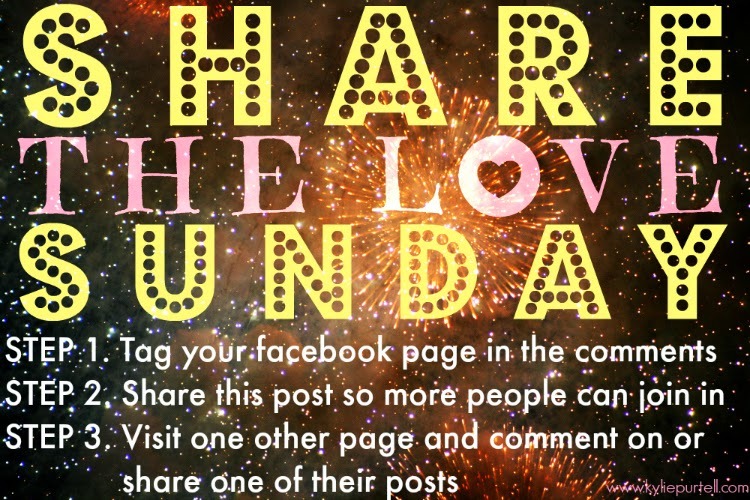 I think the Share the Love Sunday thingimajig is awesome. I love that you came up with a plan and took action, just like that! Share the love Sunday is a great idea! Must pop over. I did a social media refresher course late last year (I'm a private social media consultant) and something that was highlighted was that the optimal posts per day was actually 2-3. It is has been proven that any more than three can indeed have a negative impact on your exposure. Great post - I will look for share the love Sunday. Thanks for sharing some of the info you gleaned from the Voices 14 masterclass - very useful. 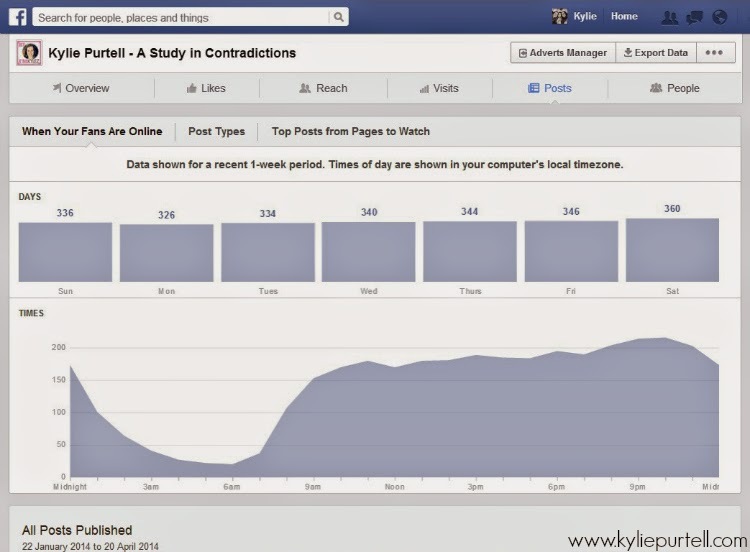 I look forward to hearing how your fb posting experiments go! Great tips Kylie! I went to the Masterclass too and got so much from it. I really need to analyse my insights and start scheduling!!! Fantastic recap of what was an awesome session. I learnt so much from masterclass! Thanks for sharing the tips and tricks. Thank you for sharing these great tips! 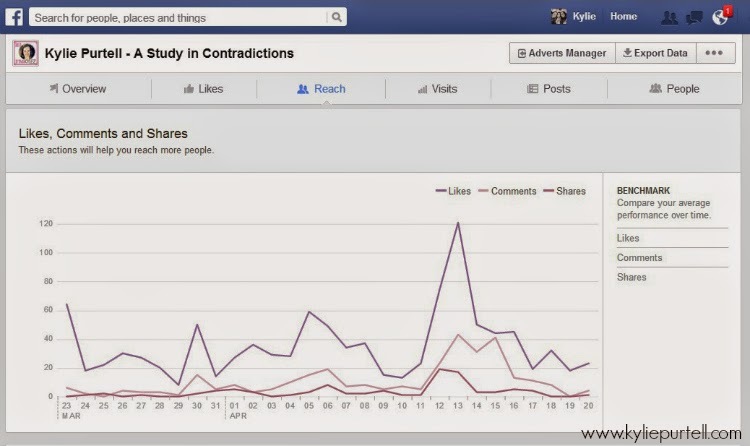 I was pretty much going to write FB off, but you're right, it's all about upweighting content through sharing + commenting. Love your idea for Share the love Sunday! I love this post. Thanks so much for sharing Kylie. I am a complete novice when it comes to FB. This is really great info, Kylie. Thanks so much. I think reach is down so much over the past 7 days - its like FB have changed their algorithm again. I find it to be a very hit and miss medium for reaching others and getting that engagement! Thanks for all the info you shared. This is so good Kylie. Thank you. I really regretted not being able to go to the Masterclass, and this is a terrific recap. Have learned so much!! Great tips Kylie - as someone who makes a living out of social media, Facebook is driving me freaking nuts. Thanks for all this Kylie. Please, keep it coming. Been loving your tips on your Facebook page too. I've immediately flicked over to Facebook to incorporate quite a few of your tips. Cannot wait till Sunday to participate there too.